First of all, it's been awhile since I've participated in a Read Aloud Thursday event over at Hope is in the Word. Every week I see it come up and I miss it. So I'm glad to be back. Without further ado - here is what we've been reading aloud with Bookworm2 (age 1 1/2). For starters, I should also update you all to let you know that he has suddenly become a reader! When he first joined our family he had NO concept of what a book even was (heartbreaking to this reading mommy!) but constant exposure seems to have done the trick. Now he never seems to want to stop reading and he is carting books all over the house. Bathtime (Baby's World, DK Publishers) is now out of print which is might prove to be a HORRIBLE situation should we ever lose or destroy this book. This was an absolute favorite of Bookworm1's and so it's kinda fun to know that it's Bookworm2's favorite also. We read this book ALL. THE. TIME! Jonathan and I still do not understand the fascination but we both have it memorized and can recite it whenever we need to. I've recited it to the little guy in the grocery checkout line when I need to hold his attention. Works like a charm! The last page includes the line, "I put my bath toys away and I say 'bye-bye'!" which always results in a fit of wild waving and a huge dimpled smile. The most awesome thing about this book though is that even Bookworm1 has it memorized and "reads" it to his little brother. So. Adorable. They both chuckle their way through this because Bookworm2 thinks everything that his older brother does is just perfectly awesome and he sits and listens to him "read" with giggles and smiles, which cause a happy reaction in brother also. Love this book for all the good memories it is producing. 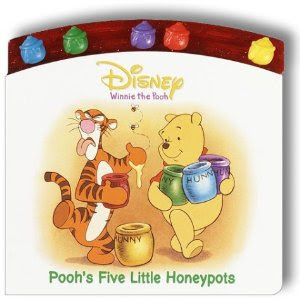 Pooh's Five Little Honeypots is also quite fun because it has five little honey pots to slide around on top of the book. Our youngest is quite the little kinesthetic learner and so anything that he can touch, poke and move around is sure to be a huge it! This book is told in rhyme and is lots of fun. I picked this up when Bookworm1 was little and he still enjoys reading this one with us. The storyline is that Pooh has five honey pots up on the shelf and he takes them down one-by-one to eat them all up! By the time he has eaten four of the pots, well, there is just one left and it must be awfully lonely up there! This is a great hands-on book which also allows us to learn basic counting. Plus, it tells us about some of our favorite characters! Lastly (for purposes of this post anyway), Bookworm2 frequently picks up a copy of Baby Faces, by Margaret Miller, and hauls it over for a "reading." 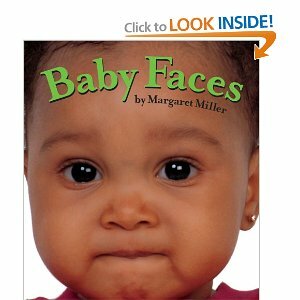 Each page spread on this book includes a close-up picture of a baby's face and a descriptive word to go along with the picture. The babies are making all sorts of faces to go with words like "stinky" and "Yippee!" "Our" favorite page is "Uh-oh" and he knows exactly which page that is! He flips to it and yells out, "UH-OH!" with great gusto every single time. I'm happy with it if he is happy with it. He's starting to get into more short stories but mostly we're about pictures of babies and short descriptive words and phrases. Considering he wouldn't come near a book except to consider it a play thing, I think we're making awesome progress and I couldn't be more delighted. It's very fun to see him engaging with stories and bring books to us to read with him. It's great when he waddles up, hands me a book, and plops himself down in my lap. It's the best cuddle time I think I could ask for and I love it! To find out more about what others are reading aloud with their kids, visit Hope is in the Word. You could also play along yourself and share your own book goodies! In the future, I plan on using this meme to keep up with my Reading My Library challenge. But for this week, we stuck to our own home library. Congrats on turning Bookworm2 on to books and reading already. Well done! Oh, I'm so glad Bookworm2 has discovered books!!!!!!!! So glad you're back for RAT, Carrie! I love it when my little guys want to "read" a book with me. I've noticed Sam (20 months) has started "reading" books to himself also. Yeah!!! It's not just a chew toy anymore. :) Just wait until your oldest reads for real and can read a picture book to all the kids. That's lots of fun to watch, too! I had to tell you that we got a Bubba and Beau book at the library yesterday, ALL the children loved it! The baby hound dog is perfect for them! And of course I read it in my best country twang voice so I have fun too! Max used to "read" our Dr Seuss books to Tavis, it is amazing what they can memorize! Baby Faces is great, or any book with baby faces in it. At age 1-1/2 my son really loved Higher Higher by Leslie Patricelli (the non board book version). George and i had the Dr. Suess "ABC" book -- and There's a Wocket in My Pocket, plus Hand Hand Fingers Thumb, among others -- totally memorized, also. It would surface at odd moments, like when we were sleep deprived and slap-happy.